Packaging Details Height Width Depth Weight 5.45" 3.05" 3.05" 0.7 oz. Details HPLC tested for potency and purity. Potent antioxidant. » Support healthy lipid profile. » Enhance health. 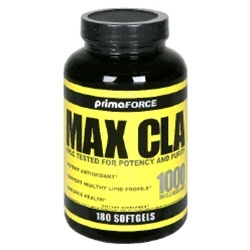 Max CLA (Conjugated Linoleic Acid), HPLC tested for potency and purity, is a potent antioxidant and is scientifically proven to help support healthy lipid profiles and enhance overall health. (These statements have not been evaluated by the Food and Drug Administration. This product is not intended to diagnose, treat, cure, or prevent any disease.) Made in USA. Nutrition Facts Serving Size 1 softgel Servings Per Container 180 Amount Per Serving % Daily Value Calories 9 Calories from Fat 9 Total Fat 1 g 2% Saturated Fat 0 g 0% Polyunsaturated Fat 1 g Conjugated Linoleic Acid (CLA) 700 mg Sunflower/Safflower Oil (High Linoleic Acid) 1,000 mg Cis-9, Trans-11 Isomer 300 mg Trans-10, Cis-12 Isomer 330 mg *percent Daily Values are based on a 2,000 calorie diet. Ingredients: Other Ingredients: Gelatin, Capsanthin, Water. *These statements have not been evaluated by the Food and Drug Administration. This product is not intended to diagnose, treat, cure or prevent any disease. Directions As a dietary supplement, take 1 softgel 3 times daily, preferably with meals.